On Friday, 19 August 2016, the first World Rohingya Day demonstrations took place around the world. Rallies and demonstrations took place in London, UK; Washington DC, Toronto, Canada, New York, Chicago; Stockholm, Sweden; Boston; Los Angeles; and many other places. The speakers demanded end to the ongoing genocide of Rohingya people who are indigenous people of Myanmar (formerly Burma) living in their ancestral lands. 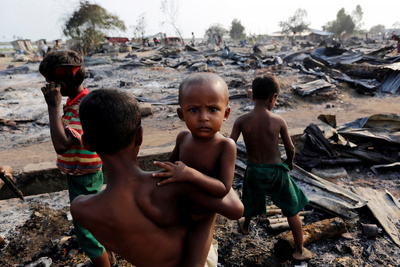 The Rohingyas of Myanmar are a stateless people who are the most persecuted people in our time. They have been facing genocidal campaigns, especially since 2012, which saw a series of ethnic cleansing drives by the Rakhine Buddhists of Arakan – planned and aided by the local and central government and organized and mobilized by racist politicians and bigoted monks. It was a national project put into practice for the elimination of the Rohingya, who differ in ethnicity and religion from the majority Buddhists in this country of 55 million people. As a result, probably thousands were lynched to death, a quarter million lost their homes, tens of thousands were forced to choose exodus from this Buddhist den of intolerance and hatred, and an estimated 140,000 Rohingya internally displaced persons were caged in concentration camps in and around Sittwe (formerly Akyab). So evil was this proto-Nazi criminal eliminationist policy that anytime a fact-finding international aid agency or an NGO tried to voice its concern on deplorable inhuman condition of the Rohingya people, it was not only silenced by hateful Buddhist mobs that quickly rallied with hateful banners and posters, but was also barred from visiting the place next time. In this series of government sponsored pogroms, Ma Ba Tha – the terrorist organization of Buddhist monks, led by Wirathu – naturally played the role of Thein Sein’s hound dogs, and made the life of Muslims, living both inside and outside the Arakan state, unlivable. In essence, the world saw Buddhist Nazism in practice in much of Myanmar, especially in the western state of Arakan (Rakhine), bordering Bangladesh, where the Rohingyas have been living for centuries. Even the Nobel Laureate for peace, the much hyped democracy icon, Suu Kyi, chose to ignore the serious existential plight of this unfortunate people. An official census taken last year purposefully excluded the Rohingya denying them the voting right in country’s general election. All the political organizations that once represented the Rohingya people were disallowed from contesting in the election, and so were the former elected Rohingya MPs. It was all part of a very sinister plan to eliminate the Rohingya politically, socially and economically. The fate of the Rohingya refugees did not fare well in the next-door Bangladesh either; not only were they unwelcome there but aid organizations that provide a modicum of relief to Rohingya continue to be doggedly harassed by government agencies. With the election win of Suu Kyi’s NLD in the general election last year, a flicker of hope emerged within the international community who expected that she would self-correct her inexcusable role and do the needful towards improving the lot of the persecuted Rohingya. She had her own problems, too. Constitutional roadblocks were put on her way by Thein Sein’s quasi-civilian government that denied her the right to become the president of the country. But she was able to outmaneuver USDP’s intent smartly by creating a new post with more power. However, as days turned into months, nothing positive happened even as Suu Kyi took the reign of the government in Myanmar earlier this year. More problematically, she came under widespread international criticism for refusing to even mention the name “Rohingya” and rebuked an American diplomatic who did. Equally disturbingly, she revealed her own prejudice when after a heated interview with BBC’s veteran journalist, Mishal Husain, she was reportedly heard to say angrily, “No one told me I was going to be interviewed by a Muslim.” The case of the Rohingya looked utterly hopeless! Then like a lightning bolt came the latest news: Suu Kyi has solicited the aid of Kofi Annan, former Secretary General of the UN, to lead an “Advisory Commission on the Rakhine State.” The Annan-led commission includes both national and international officials who will recommend “lasting solutions to complex and delicate issues” in Rakhine state. What brought this change of heart? Is it because Suu Kyi’s government has realized that for Myanmar to move forward it must loosen its ties with her problematic past that had earned only bad reputation from the international community? Is it because of the realization that the ongoing abuse and discrimination of the Rohingya is also threatening to undermine Myanmar’s historic opening and democratic transition, let alone delaying the needed economic prosperity? Whatever may be the true intent of Suu Kyi’s government, there is little doubt that this decision was a timely one, and it was a bold one, too. Many Buddhists inside Myanmar, esp. in the Rakhine state, are die-hard racists and bigots. They resent this decision. They would rather see Rohingya and other religious minorities eliminated altogether from their country one way or another. Decades of falsification of historical truths and hateful propaganda that were propagated by the military government and hate provocateurs like (late) Aye Kyaw and Aye Chan have turned them into killers, justifying and allowing them to do savage crimes against the Rohingya and other Muslims. Forgotten in that lacunar worldview was the hard fact that the forefathers of today’s Rohingya people had settled in Arakan before those of the Rakhine people. Myanmar needs the necessary foreign investment to move up economically, and cannot allow a delay of that process until investors’ perception of human rights of the country improves significantly. The international community has been dissatisfied with Suu Kyi’s slow response to ensuring protection, fairness, and justice for all of its people, esp. the Rohingya people whose plight is simply inhumane and unacceptable. Human rights groups have long been demanding donors to leverage their aid, and for the broader international community to pressure the Suu Kyi government to end the repression. They have been demanding that Myanmar respect international law, end its complicity in violating Rohingya rights and punish those promoting and carrying out ethnic cleansing whatever their motivation. 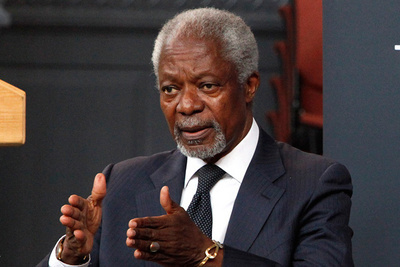 Suu Kyi, thus, had to find someone like Mr. Annan with a prudent track record that would provide the necessary positive publicity for her government, let alone infusion of the needed foreign money. After leaving the UN, Mr. Annan has undertaken a few of these missions. In 2007, a disputed election in Kenya lead to widespread communal violence and threatened to unravel and otherwise thriving country. He mediated between the two parties and helped establish a commission of inquiry that investigated post-election violence, turning its findings over the International Criminal Court. He mediated a power sharing agreement that ended the prospect of further violence. It was no accident that groups like the Amnesty International have welcomed the decision. “Today’s announcement is a sign that Myanmar’s authorities are taking the situation in Rakhine state seriously. But it will only have been a worthwhile exercise if it paves the way for the realization of human rights for all people in the state,” said Rafendi Djamin, Amnesty International’s Director for South East Asia and the Pacific said in a statement released earlier. For years, the official Burmese mantra has been that "no foreigner can possibly understand Rakhine's problems". Thus, for the first time, the Burmese government is seeking international expertise to try and solve one of the country's most complex problems. It is a big shift for the government in Myanmar. Many human rights are also concerned because of the inclusion of Daw Khin Saw Tint - a known racist and bigot - in the commission. She is a Rakhine Buddhist who chairs the Rakhine Literature and Culture Association (Yangon), responsible for promoting intolerance against the Rohingya people. As Burmese human rights activist, Dr. Maung Zarni has shown in his blog, Ms. Khin Saw Tint remains a very hostile, anti-Rohingya zealot who falsely considers that Rohingyas have no history prior to the Burma's independence from Great Britain. I wish Suu Kyi had been more careful in selection of the members of the Advisory Commission. After being named in the commission, Khin Saw Tint said she believes working together with independent and highly respected international figures will present a clear image of what is happening in Rakhine State to the international community. “The problem can only be solved with a bilateral approach,” she said. I pray that she is not speaking with a forked tongue and does not torpedo the needed task of the commission, which does not include a single Rohingya. The Annan commission is expected to start work in September and will release a full report, including a set of recommendations on “conflict prevention, prevention, humanitarian assistance, rights and reconciliation, institution building and promotion of development of Rakhine state” by the second half of 2017. However, as we all know too well, the litmus test going forward is whether or not the government will accept and implement those recommendations.